I spent five years living in Perth. Close enough to Subiaco Oval that when the Eagles fans booed the umpires it haunted my house. The mining boom was running hot and the (in)famous Eagles ran even hotter. Two thirds of the town seemed to be permanently dressed in blue and gold. The boss of West Coast merchandise must have had the easiest job in the world. I was reminded more than once that I was from over east. The West Coast’s first ever game was against Richmond. In that same week my brother Paul turned four. 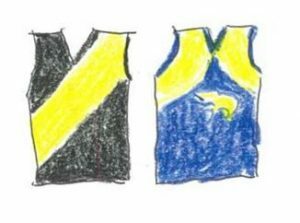 For reasons known only to himself, that country Victorian kid turned out to be an Eagles supporter. Now living in Brisbane, Paul’s lived everywhere from Vancouver to Adelaide, I wouldn’t know the last time he was in W.A. When Ben Cousins signed for the Tiges I texted Paul, You gunna barrack for Richmond now? He shot back, are you? When we play the Eagles I feel I’ve got more on the line than normal. More than when we play Carlton, more than Collingwood! The first half was played in brilliant sunshine. At half time the Eagles lead 5.I3 to 5.6. I hit the pizza stand with the feeling every Tiger fan knows. The battle between hope and experience. Hoping for the best but expecting the worst. Then, in the third quarter, the game changed in two flashes of brilliance. Daniel Rioli gathered near the boundary, did the old one-two with Dion Prestia, then slotted a brilliant banana goal. Minutes later the sky changed from brilliant blue to the purple of an old bruise. A mighty bolt of lightening cracked over Punt Road and then the rain set in. It poured. And poured. People filed past me in droves up the isles but I just sat there and got wet. I was dressed for a West Leederville BBQ when I arrived but was soon drenched like I’d had too many and fallen into the pool. If you’re at the footy you may as well be at the footy. And so the Tigers were at the footy and led at three quarter time by a goal. With five minutes to go it was still anyone’s game. Neither side had kicked a goal in the last quarter. The familiar feeling. Then Dustin Martin, whose centre of gravity you can see from the stands, took possession of the ball at half forward. He was fiercely tackled by West Coast’s Jackson Nelson, but Dusty kept his feet and kicked the ball about 50 centimetres to Shaun Grigg. Brandon Elllis then linked the ball to Jack Riewoldt who went back and kicked his only goal of the day. Rioli kicked the sealer minutes later. The siren rang and I high fived some other anonymous soaking Tiger. On the train on the way home some Tiger wags gave a stirring rendition of the theme song. At Auburn station the whole carriage answered back. I haven’t heard from Paul. 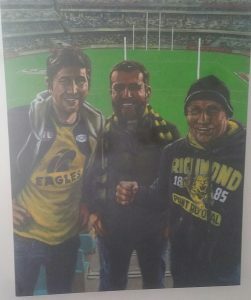 Koroit artist Matthew Stewart’s painting of Paul, Me & Dad. Richmond v. West Coast a couple of years back. Tiger fan Chris Daley works in Community Nursing, which has taken him to Perth, Broome and now Dandenong. 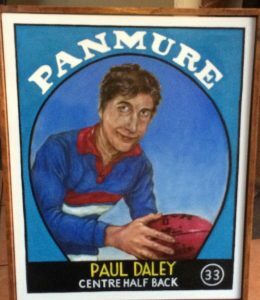 Being tall, he used to get a game in the ruck playing bush footy outside of Warrnambool.